Modern Italian cooking that doesn't lack for rustic, homestyle flavors. The spaghetti dish was like a caprese salad in pasta form. Hours: Mon., Wed.–Thu. 11:30 a.m.–10 p.m.; Fri. 11:30 a.m.–11 p.m.; Sat. 10 a.m.–11 p.m., Sun. 10 a.m.–9 p.m. I love eating pasta more than almost any other food. In the course of my tenure as the Express food critic, I've reviewed some pretty good Italian restaurants, but for whatever reason, the pasta dishes were often the ones that left me feeling a little cold. Fresh pasta, in particular, would always either be not delicate enough or not toothsome enough, over- or undercooked, or buried under too much sauce. So, I'm happy to report that I may have found the best pasta restaurant in Oakland: Belotti Ristorante e Bottega, which opened last month in Rockridge in the old I Squared/Homespun Fare spot. Apparently, chef-owner Michele Belotti was something of a wunderkind back in northern Italy, having worked in professional kitchens since he was fifteen years old. By the time he was old enough to vote, he was cooking at Michelin-starred restaurants — first near his hometown of Bergamo (in the Lombardy region), and later in Piedmont wine country. In 2011, Belotti — still just 24 years old — moved to the United States to become the executive chef at Ristobar in San Francisco. As Belotti tells it, the restaurants at which he honed his cooking chops in Italy were forward-thinking places — steeped in the traditional flavors of the immediate region, but not averse to busting out a modern cooking technique. For his own restaurant, Belotti aims to fuse the traditional and the modern in a similar way — though, for the most part, that doesn't mean he's particularly interested in the various gadgets and culinary trickery that tend to be associated with so-called "modern" gastronomy. When Belotti talks about modernizing the traditional dishes of Lombardy and Piedmont, which comprise most of the restaurant's menu, he's usually talking about refinements to the cuisine that have more to do with upping the luxuriousness of old-time recipes than anything that's strictly technology-based. This is perhaps best exemplified in the restaurant's signature item: the fresh pasta dough that Belotti makes in huge quantities each morning. According to Belotti, the most basic, traditional pasta dough recipe consists of just flour and eggs — maybe seven of them to make a pound of pasta. But as is the case at many of the better restaurants in Italy, Belotti uses more than double the number of eggs for his pasta dough, and uses the yolks exclusively. The pasta costs much more to make, of course, but the payoff is a richer, more full-flavored dough that Belotti is able to roll out much more thinly. The results speak for themselves: The various stuffed pastas, in particular, were tender, ethereally light, and retained just the right amount of toothsome bite. In terms of flavor, though, Belotti stays true to the traditional flavors of the regions in Italy where he spent the first part of his career. If you only plan to order one dish, let it be the casoncelli, a stuffed pasta that's based on Belotti's mother's recipe. Each little meat-stuffed bundle was like a cross between a dumpling and a raviolo, the filling a smoky-savory mix of finely chopped prosciutto, pork shoulder, and beef. To finish the dish, the chef tossed the pasta with cubes of smoked pancetta and a velvety sage-infused brown butter sauce that glistened as it clung to each casoncelli. The Agnolotti di Lidia — another meat-stuffed pasta, but shaped like plumped-up postage stamps — was similarly satisfying. The agnolotti were filled with a rich mixture of slow-braised and roasted meats, but what got me salivating was its intoxicatingly heady aroma, which came from the sauce: a beef reduction made over the course of three days from bones roasted in the fat taken from the ribeyes that Belotti uses to make steak tartare. In case it isn't apparent yet, it should be noted that the food at Belotti Ristorant is decidedly Italian-Italian rather than Cal-Italian, especially in terms of the provenance of the ingredients, which are largely imported from Italy. But the focus on the quality of a handful of simple ingredients for each dish — and the specificity of the ingredients that Belotti goes out of his way to import — feels very much in the same spirit as the Bay Area's more California-centric Italian restaurants. For instance, he swears that the Trapani sea salt that he imports from Sicily to use in his pasta cooking water is essential to give the pasta the proper taste. 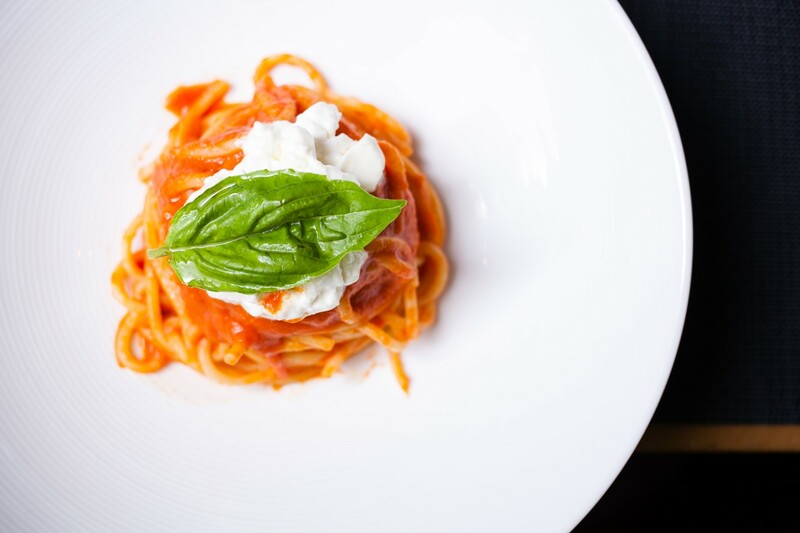 A dish of spaghetti and burrata stands as testament to the power of a few simple, high-quality ingredients: The thick strands of spaghetti are, of course, freshly handmade each day. The burrata is imported from Puglia, which is said to be where this type of cheese first originated. And the tomato sauce is made from tiny, extremely ripe tomatoes imported from the town of Corbara in southwestern Italy, near Mount Vesuvius. 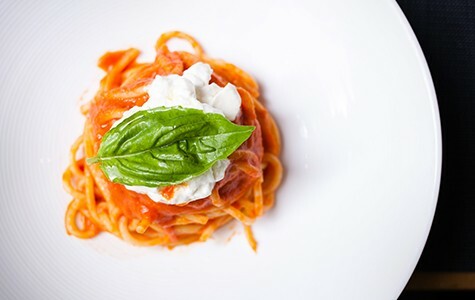 The cool, soft burrata oozed into the tomato sauce, adding a creaminess that was both rich and refreshing. It's a killer combination — like a caprese salad in pasta form, as Belotti put it. The closest Belotti comes to the "molecular" strand of fine dining is in his version of Italian steak tartare, or battuta — literally, "beaten," because, as the chef explained, Italians cut the raw steak by hand; hence, the dish's defining sound is the thwack-thwack-thwack of a knife knocking against a cutting board. Belotti's take on the dish might be mistaken for one of Andy Goldsworthy's environmental sculptures, or perhaps a high-end dessert: The meat was shaped into a wide circle so that it resembled a blood-red raspberry tart. On top, there was a scattering of microgreens, a quail egg yolk, and a careful arrangement of black dots and creamy white peaks — chocolate chips and whipped cream? No. The dots turned out to be boba-like truffle "caviar" (i.e. spherified black truffle juice); the peaks were a fondue of melted Parmigiano Reggiano cheese, thickened with xanthan gum and piped out of a pastry bag. Bells and whistles aside, this dish was all about flavor — specifically, the intensely beefy flavor of the dry-aged ribeye that Belotti hand-cuts; the cheese and truffle only added a subtle undercurrent of umami. You'll want to make sure to get some of the streak of aged balsamic vinegar on the side of the plate to add a nice hit of acidity to each bite. My only real quibble was that there was a bit of a disconnect between the homey, comforting quality of the food and the restaurant's cool, modern vibe — the dim lighting, the square plates, and so forth. Meanwhile, the tables were so cramped together that every time I got out of my seat I was afraid I'd knock over a wine glass on a neighboring table. All the restaurant needs is a little bit more warmth. Apart from one friendly Italian barman, the service tended to be dour and disinterested. During my first visit, our server seemed to feel put upon every time we asked a question about the menu — perhaps in part because, even on a weeknight, the restaurant was slammed. We couldn't wrangle any useful information out of him when we were trying to choose between two pasta dishes, and when we asked what the zucchini side dish consisted of, his response was a withering, "It's a vegetable." Ultimately, the food spoke for itself. Aside from the pastas, which were the unquestionable star, I also enjoyed the brasato, a big hunk of braised flat-iron steak served with hen of the woods mushrooms over polenta — a typical preparation in Bergamo, whose residents Belotti says are known as polentoni because of the massive amounts of polenta they eat. If you feel like splurging, go for the sustainably fished Chilean sea bass — now okay to eat, apparently, after a decade or so of being taboo among eco-conscious eaters. Belotti's preparation is relatively simple: The fattiness of the fish was allowed to stand on its own, accented by some roasted fennel, which added a lovely complementary sweetness. Eventually, Belotti plans to open a small market in the back of the restaurant, where he'll sell fresh pasta and prepared sauces. What I'm really excited for, though, is this: In a couple of months, the chef hopes to offer a pasta tasting menu. Six or seven of Belotti's pasta dishes in a single sitting? I'll be the first in line.